Feb. 14 (Xinhua) -- Chinese President Xi Jinping met with U.S. Secretary of State John Kerry at the Great Hall of the People on Friday morning. 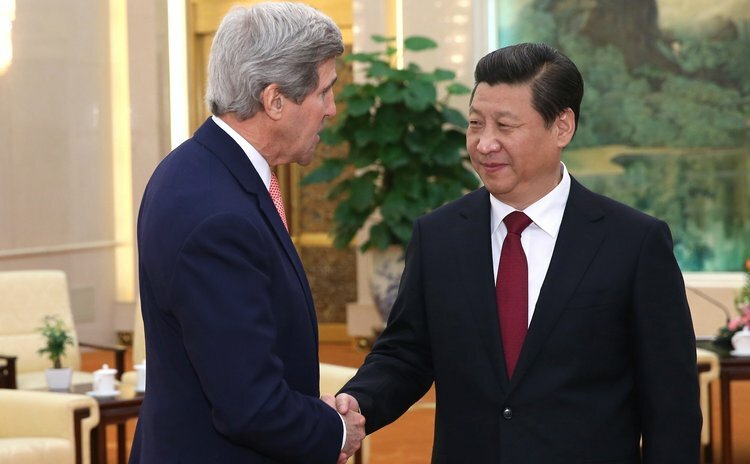 BEIJING, Feb. 14 (Xinhua) -- China and the United States on Friday agreed to advance a new model of ties between major powers as U.S. Secretary of State John Kerry visited Beijing for talks. "China is firmly committed to building a new model of major-country relationship between China and the United States together with the U.S. side," Chinese President Xi Jinping said in his 70-minute meeting with Kerry at the Great Hall of the People. China will continue to enhance dialogue, boost mutual trust and cooperation and properly handle differences in the new year so as to forge ahead with the lasting and healthy development of the ties, the president said. Xi and U.S. President Barack Obama held a historic summit last June at the Annenberg Retreat in California, during which they reached an agreement on building a new type of major-country relationship which features no conflict, no confrontation, mutual respect, cooperation and common prosperity. Echoing Xi's remarks, Kerry said managing the new model of relationship between great powers is "very important" for the United States as well. He told Xi that President Obama "is very much looking forward to seeing you again shortly." "Xi's remarks sent a stable and positive signal for China-U.S. ties, which means the two countries' general target and roadmap to a new model of relationship remain unchanged, though they sometimes have discord," said Da Wei, a research fellow at the China Institutes of Contemporary International Relations. Kerry's visit came as the two countries celebrated the 35th anniversary of their diplomatic ties at the beginning of this year. Apart from Xi, Kerry met other Chinese leaders and senior officials during his 24-hour visit, including Premier Li Keqiang, State Councilor Yang Jiechi and Foreign Minister Wang Yi. In talks with Kerry, Wang said the two countries should respect and accommodate each other's core interests and major concerns, calling on the two to "accumulate and unleash the positive energy of the relationship and promote it towards continuous progress on the right track." Hailing his meeting with President Xi as "very constructive and positive," Kerry told Wang that he hoped 2014 will be "a year of concrete progress" in building a new type of relationship, and "managing bilateral differences effectively and finding a way to cooperate practically when possible." The two sides also reached "broad consensus" on this year's high-level engagements, dialogue and concrete cooperation in various areas. They agreed to start preparation early for new round of Strategic and Economic Dialogue -- scheduled for China this summer -- and Consultation on People-to-People Exchange, promote an early signing of a bilateral investment agreement, and try to build a mechanism to inform each other about major military actions. They also discussed cooperation on antiterrorism, nonproliferation,climate change, and other major international and regional issues. "The two countries stepped up their discussion on bilateral cooperation in wide range of issues, with the aim to flesh out the new model of relationship with concrete actions and reciprocal cooperation," Da said. Apart from bilateral ties, the Korean nuclear impasse is high on the agenda. "China will never allow chaos or war on the Korean Peninsula," Wang told Kerry in the talks. "China is serious in this, as shown not only in our words but in our actions," he said, adding the top priority at the moment is to resume six-party talks as soon as possible. "At every level in all our conversations today, China could have not more forcefully reiterated its commitment to that goal," said Kerry in a press briefing Friday evening. China has always played a role in trying to solve the Korean nuclear issue, said Foreign Ministry spokeswoman Hua Chunying in response to Kerry's remarks in Seoul, appealing for China to do more. China has been persuading all parties involved through all channels, and maintaining close communication with them, she said. "China and the United States share the same goal of regional peace, stability and denuclearization. They are just different in how to realize such a goal," said Huang Ping, a researcher at the Chinese Academy of Social Sciences. With regard to the South China Sea and East China Sea disputes, China reiterated its stance and reaffirmed determination to safeguard national sovereignty and territorial integrity. Wang urged the United States to take an objective and impartial stance, and not to "take a side." The United State should respect historical facts and China's sovereign interests, and take tangible action to promote mutual trust in the region so as to safeguard regional peace and stability, he added. Kerry arrived in Beijing from Seoul Friday morning for his 24-hour China visit.